This week, we had a few extra shopping bags lying around our house. 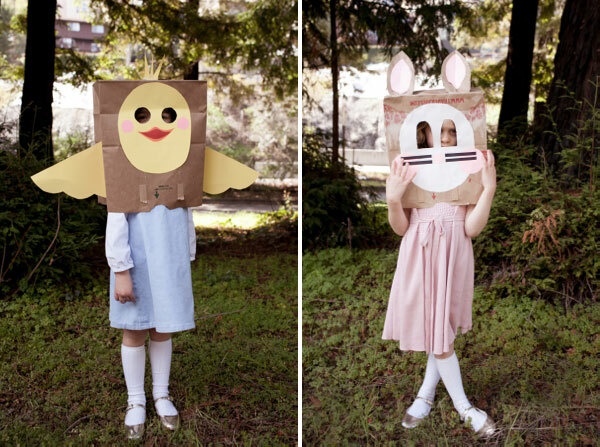 So in honor of the season, we decided to transform them into funny Easter Animal Masks. 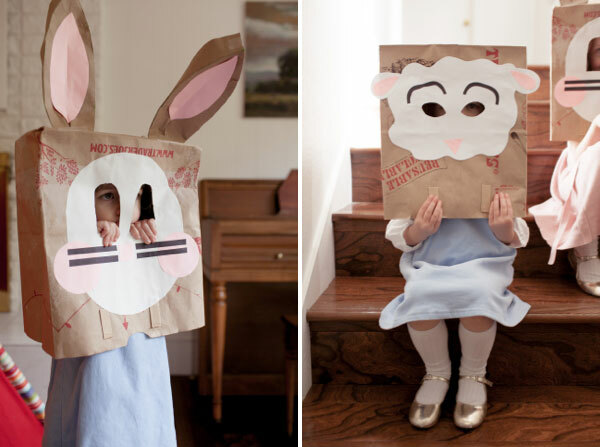 These are easy for kids to make, so it’s a great activity to do as a family. And they’re the perfect way to keep kids entertained during that Easter brunch. Step 2: Lay the shapes on top of the bag and arrange in a pleasing manner, once you’ve got them where you like them, start gluing. Step 3: Glue the wings on by folding a 1″ flap and attach them to the sides of the bag. Step 4: Don’t forget the cute yellow feathers on top of the head. We also folded a small flap on the bottom of the feathers to give them a base on which to be glued. We found that the feather on top may need some coaxing to stand up and tape, may be useful in this process. Step 5: When the glue is dry on the face, cut out the eyeholes. 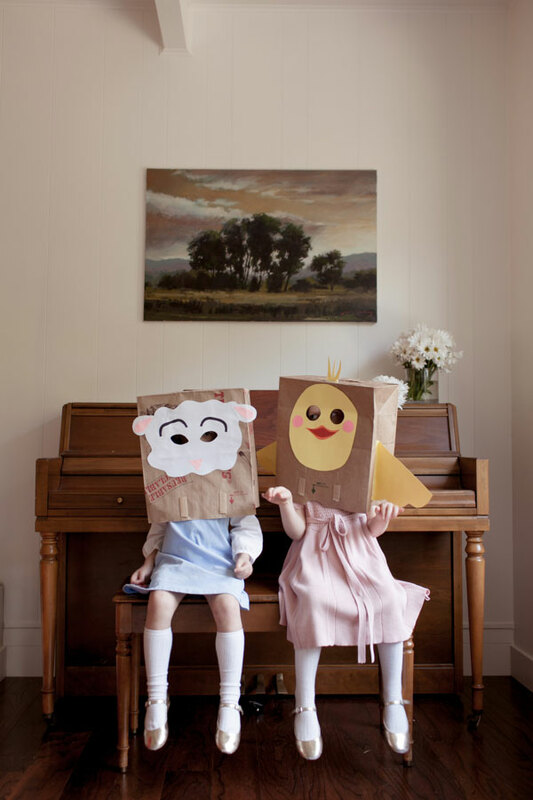 Tip: If you don’t have a child near by when doing this to measure their location we found that they are higher on the bag and closer together than you might expect. Step 3: We found that lambs ears are so cute and floppy and that gluing them downward facing really made the look. Step 4: When the glue is dry on the face, cut out the eyeholes. Tip: A lamb’s eyes are on the side of their head, so to create this look we made angled oval eyes. Step 1: Cut out the shapes for the bunny; 1 long oval shape for the face, 2 medium circles for cheeks, 1 square for the nose, 4 long and skinny rectangles for the whiskers, 2 long leaf shapes for the contrast in the ears. Step 3: Cut out the holes for the eyes, we chose a fun arch shape for the eyes to give the bunny more charm. Tip: If you’re unsure about where to put the eyes, cut out the shapes you want for the eyes and lay them on the face until you get them in a nice place, once there you can trace them and cut them out. Step 4: Cut out both of the rectangular sides of another paper bag. These already have folds (hot-dog fold). Cut out 4 strips of the paper bag. Our strips were roughly 2” each. Steps 5: Using the folded rectangle, cut out long leaf shape. This will be your bunny ear! Step 7: Carefully tape the folded strips to the earshape. 2 strips per ear. Step 8: Repeat for ear #2.
haha, great idea! I want t be 6 years old again. This is precious!! 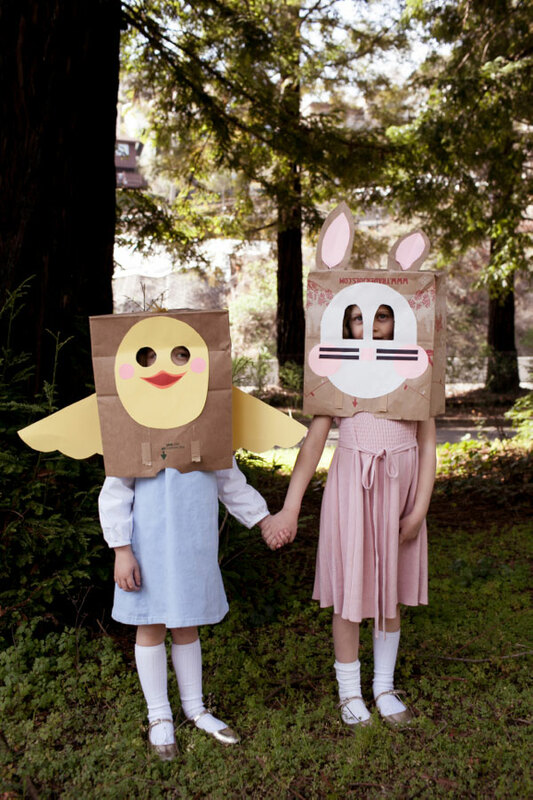 It reminds me of the “costumes” my brother and I would make out of paper bags. I am in the middle of a Trader Joe’s bag challenge (i.e make stuff out of their bags). I am totally going to point people to this post. What a sweet idea. Oh my gosh, these are hilarious and adorable. I love the photos! This is the cutest thing I have seen in a long time! how fun! Love the girls’ knee socks and silver buckle-shoes too! 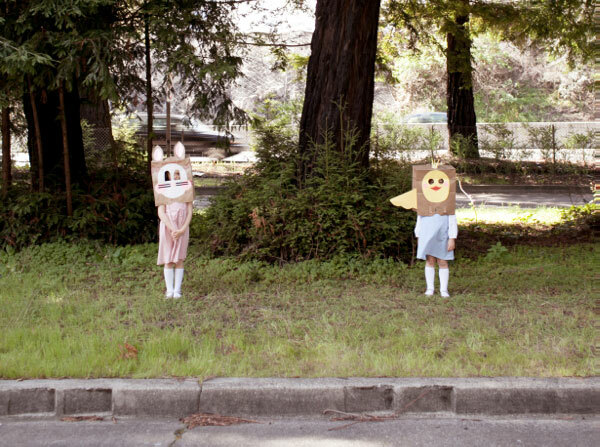 I’m torn between thinking it’s cute and getting an uncanny feeling a la The Shining. so adorable…. i should’ve done this with the kids i babysat today! 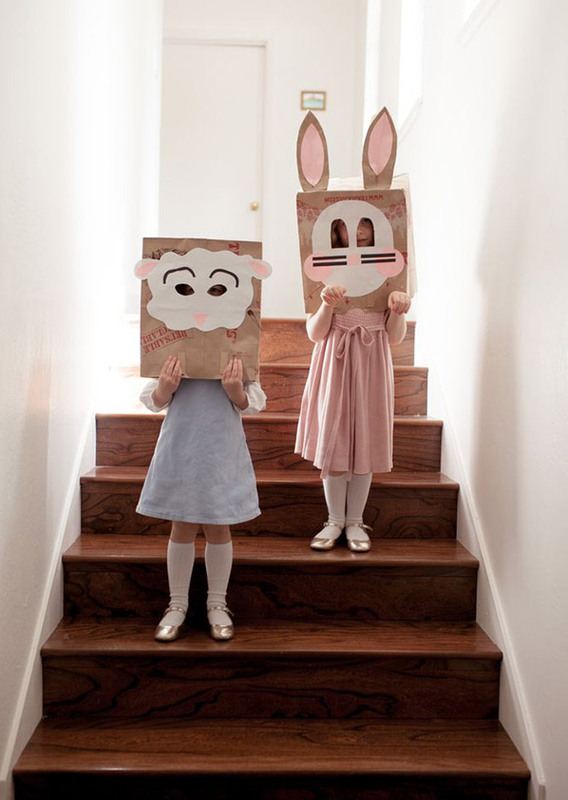 Your DIY masks really look cute on your kids! Thanks for the suggestion and taking time to put up the DIY steps. I am interested in those beautiful gold flats! Source? i adore these. too cute.